Disaster. I just wore through my very favorite pair of pants. That may not sound like a big deal to you, but you didn’t make a New Year’s resolution to not buy any clothes this year. It’s only March and I’m already in crisis. When I made my resolution, I didn’t think it would be that big of a deal. Because I’m kind of a nut, I’d already packed up most my clothes and stored them in the basement in favor of a “capsule wardrobe.” I kept a mere 46 pieces of clothing in my dresser because, efficiency! This meant, I figured, I would have plenty of additional clothing to plunder when I grew weary of the allotted 46. The problem is that while there are people who deal with stress in healthy, productive ways, I am not one of them. Rather than meditating or exercising or deep cleaning the linen closet I inevitably pick an activity that leaves me awash with regret: eating, binge-watching the Real Housewives, or giving myself bangs. However, I am a problem solver, a doer, and so what I am doing is going gluten-free for the next few weeks. Not because I think carbs are bad or gluten is unhealthy for me, personally, but because, for me, toast is a gate-way drug. If I have eaten just one piece of toast, it is only because the other three are still in the toaster. 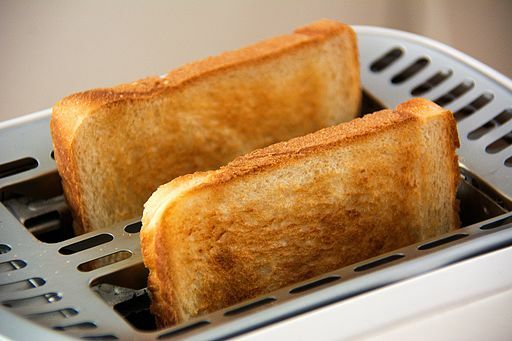 Q: How many slices of toast are in a serving? A: However many you have. Come here, you delicious darlings! Last month I was convinced that my ever more corpulent form was due to all the delicious red wine winter inspires me to consume. For eight days I drank nary a drop. Nothing. I lost exactly zero pounds. (Actually, a lie. I gained two.) “I never thought it was the wine,” said Hubby, staring pointedly at the peanut butter toast in my hand. Clearly, a witty retort was in order, but it’s ever so hard to talk with your mouth full. I sure hope this works. It has to. I’m running out of jeans and am not the genetically gifted sort of person who could embrace the “Leggings as Pants” movement, never mind the mortification my children would experience should I attempt it. It really wouldn’t take much to reverse the trend and be able to access the extra clothes I have stored away. And if not…? Well, Summer is coming. I hear it’s the perfect season for nudists.